Obit of Zoltan Zinn Collis, the author of Final Witness, whose anniversary falls today. Today marks the anniversary of the death of Zoltan Zinn Collis, the author of Final Witness. The book tells the story of Zoltan’s survival at the hands of the Nazi. In Bergen-Belsen concentration camp he survived the inhuman brutality of the SS guards, the ravages of near starvation,disease, and squalor. All but one of his family died there, his mother losing her life on the very day the British finally marched into the camp. Gone but not forgotten. Zoltan Zinn Collis thought he was born on 1 August 1940, though he was not certain, in Kazmarok, in Slovakia, as that was where his birth was registered. He was found with his sister, Edit, in Bergen-Belsen by Dublin pediatrician and rugby international Dr. Bob Collis, who brought them to Ireland and later adopted them. Zoltan married and settled in Athy, Co. Kildare. He recalled in 2006:‘I was never a child. Normal children have fun, run around, get into trouble, fall down, get picked up, get kissed better, then run around some more. But, I was never a child. For when I was a child, my home was Belsen. The games I played, I played around 20,000 rotting corpses waiting to be buried, but with no one to bury them. Oh, yes. I was a child in years. I slept in one of the flea and lice infested trestle beds, which was also part of my home. When Belsen was liberated, I did not know what liberated was, other than it was good. But you could not eat it, or drink it. It did not make a new coat. It did not stop the fleas from itching. But it was a good thing. On the very day of liberation, the fifteenth of April 1945, my mother died. I wonder what her name was. She had black hair. Can you grieve for someone you do not know? She was my mother, but I did not know her. Her hair was black. What was her name, my mother with the black hair? In another of those pits lies my brother, maybe my baby sister. Perhaps they are in the same pit. The pits are very big, there would be plenty of room for the little ones. What were their names?’ Between September 1939 and May 1945 5,750,000 European Jews perished in the Nazi genocide. This does not include thousands of infants murdered by the Nazis in late 1941, before their births could be recorded, or the thousands of people from remoter villages in Poland who were added to the deportation trains which left larger localities, without any record of their existence, or of their fate. Of the nine million Jews living in Europe before 1939, only three million remained after 1945. Bergen-Belsen was not an elimination centre, but had originally been intended merely as a transit camp. However, as the Russian Army overran Poland the inmates of the Nazi concentration camps in Poland, were moved into Germany. Belsen, designed to hold about 6,000 people, in the end accommodated nearly 60,000. They were not gassed, but merely starved, and typhus was allowed to reduce their numbers so that when the British liberated the camp inmates were dying at the rate of nearly 1,000 a day and there were some 13,000 corpses on the ground. Dublin-born Dr. William Robert Fitzgerald ‘Bob’ Collis arrived in Bergen-Belsen with a Red Cross contingent soon after its liberation by the British Second Army on 15 April 1945. Bob took on the responsibility of two blocks, one of which contained a large number of orphan children of whom the majority were recovering from malnutrition and the unhygienic conditions they had been exposed to. The second block was rapidly turned into a children’s hospital. Here Dr. Collis met Zoltan and his sister, Edit, for the first time. Zoltan had just recovered from typhus fever. Their father was a Slovak Jew and mother, a Seventh Day Adventis, from Hungary. Because she was a Christian Zoltan’s mother did not have to go, but she would not leave her family and accompanied them to Ravensbrϋck concentration camp in late 1944. A young baby girl died in the cattle trucks on the way to the camp. Zoltan never knew her name. His father died in Ravensbrϋck. Zoltan, his mother, sister Edit, and brother, Aladar, were transferred to Bergen-Belsen in January 1945. His mother died on the day of liberation; Aladar, aged five, soon after. In the camp Zoltan, Edit, and Tibor and Suzi Molnar became Bob’s ‘special children’. ‘Well,’ Dr. Collis said, ‘Zoltan, you’d better come home with me and bring your friends and relations.’ From that moment it was assumed by everybody that Zoltan and Edit, Tibor and Suzi, if nobody turned up to claim them, would eventually be looked after by Dr. Collis. Eventually, Dr. Collis brought back five Jewish children to Ireland – Zoltan and Edit Zinn, Tibor and Suzi Molnar, and a German orphan, Evelyn. Dr. Collis legally adopted Zoltan and Edit and they were accepted into his family. After schooling, interrupted by several severe bouts of illness, Zoltan began working in the hotel trade, where he met his wife, Joan. Their first child, Siobhan, was born, while Zoltan worked in Antrim. Some time later Zoltan began working in Kilkea Castle. The owner, at the time, was a survivor of Auschwitz. Zoltan and Joan bought a house in Athy, and their second daughter, Caroline, was born. Two more girls followed – Nichola and Emma. Bob Collis died in 1975. 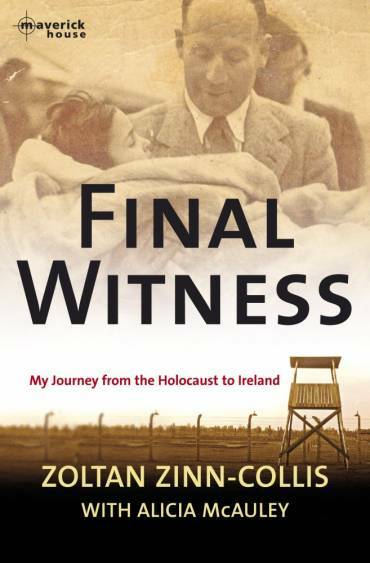 Zoltan recounted his life story in his 2006 autobiography ‘Final Witness: My journey from the Holocaust to Ireland.’ In later years Zoltan toured the country giving lectures on the Holocaust to schools and history groups. He was plagued with ill-health and lost a lung to TB, but he never let it affect his life. He died suddenly on 10 December 2012, aged seventy-two, and was buried in St. Michael’s Church of Ireland, Athy. On 27 December 2012, while staying at the home of her late brother over the Christmas period, Edith Zinn Collis suddenly passed away.